Kravitz: "I'm not joining Velvet Revolver"
Contrary to reports yesterday, Lenny Kravitz is not set to become the new singer of Velvet Revolver. The singer told RollingStone.com, "I know and love the Velvet Revolver guys but there is no truth to the story about me joining their band." A report in UK newspaper The Sun claimed that Kravitz had been "spotted" in the studio with the singer-less Velvet Revolver, and quoted an anonymous source close to the band saying: "The band wanted a big name who could easily hold his own and reckon Lenny is just the man for the job." Given the friendship between Kravitz and VR guitarist Slash, the rumour seemed plausible but the singer's comments have now put the record straight. 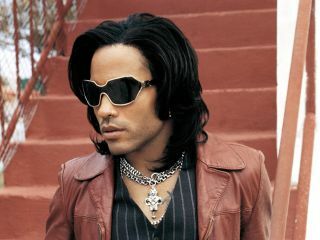 Kravitz is just the latest singer to be linked with the role, after Sebastian Bach and Spacehog's Royston Langdon. Velvet Revolver have denied other rumours they are set to launch a reality TV show to find a new frontman.